The seemingly humble nasi lemak has always had greater ambitions of its own, and has inspired Malaysians all over the world to take it to new heights. Malaysians are so accustomed to finding our nasi lemak around every second corner that we take the genius of this complete meal for granted. As a culinary composition, nasi lemak checks all the boxes for flavour, texture and when done right, beautiful presentation. What makes it truly brilliant is that it was checking these boxes even before chefs around the world agreed that flavour, texture and presentation are the three most important aspects of any dish. Ipso facto, nasi lemak was ahead of its time. Rich coconut rice, spicy sambal, soft creamy egg, crunchy peanuts, salty anchovies and cooling cucumber; and that’s before we even add on fried chicken or beef rendang or sambal sotong or telur goreng -- my inner Malaysian bursts to the fore just writing about it. Nasi lemak is enjoyed across such a diverse diaspora that you can find it from coffee shops to fine dining establishments. It was even recently named one of 10 most healthy international breakfasts by TIME Magazine. While it’s fine and dandy for us to love our unofficial national dish just the way it is on our shores, the seemingly humble nasi lemak has always had greater ambitions of its own, and has inspired Malaysians all over the world to take it to new heights. From America to Australia, many Malaysian cuisine restaurants and franchises are trying to make the nasi lemak mainstream in major cities like London, Hong Kong and New York. However, I was inspired by the smaller establishments and individuals who want only to spread their love for nasi lemak to anyone they can, in any way they can. In Liverpool, England, in a quaint little restaurant, nasi lemak is put front and centre, quite literally in the name of the restaurant -- Nasi Lemak Liverpool. In a menu smaller than that of a large franchised restaurant, nasi lemak is easily noticeable as one of three main courses. But, being a restaurant means needing to provide variety and it is here that we learn that Malaysian cuisine is still in its infancy internationally, needing some help from the more recognised Thai and Chinese cuisine. However, let’s be honest - if you’re walking into a restaurant called Nasi Lemak, you best believe you’re going to order nasi lemak. While restaurants are the easiest places to get your fix, the downside is that nasi lemak becomes just another dish on the menu. In Paris, France however, three young Malaysians went the route of a take-out and delivery, serving only nasi lemak. 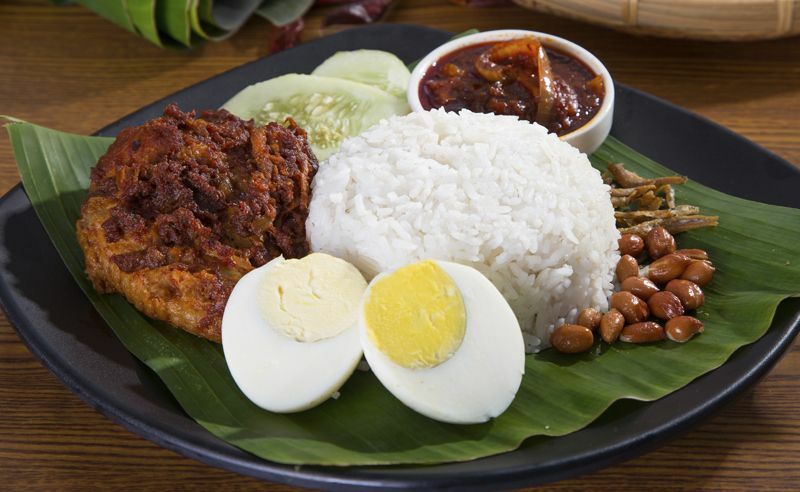 Nasi Lemak Paris or NLP was born out of pure love for the Malaysian dish and offers all the add-ons one could hope for including fried chicken, prawn sambal and fried egg. On the other side of the world, another enterprising Malaysian, Izzat Roslan also runs a nasi lemak delivery, cycling door to door around Brisbane, Australia. What’s striking about Izzat is that the delivery service is just one of the ventures he’s heavily invested in, but not one he can let go of, showing the passion Malaysians have for their food. But he isn’t the only individual to wear his nasi lemak heart on his sleeve. Several years back Ipoh-born Ping Coombes won Masterchef UK with a very gourmet nasi lemak as her winning ticket. Her variant was served with prawns, fried chicken, anchovy sambal, quail eggs, cucumber, and even edible flowers. So what is it about nasi lemak that makes Malaysians so passionate about it? Nasi lemak is our quintessential comfort food; something we can have for breakfast, lunch or dinner; something that appeals across every class and every palate of our society; something that reminds us of home when we’re far away from it. It’s one of the few dishes in our country that when it comes time to “makan”, brings all Malaysians together, without a difference in the world.